This year, we have a unique opportunity that has allowed us to open a significant residence in the Cincinnati area to the public. 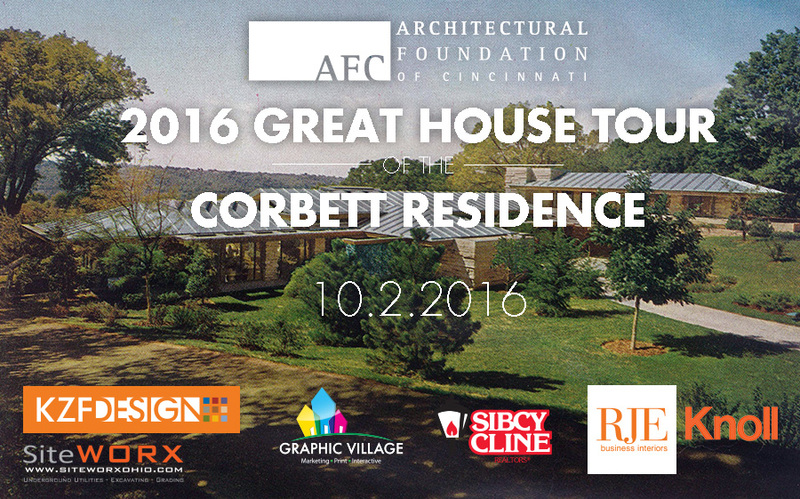 On October 2, the AFC will be offering tours of the Corbett Residence in Hyde Park. The home was the former residence of Ralph and Patricia Corbett, former owners of Nutone and noted patrons of the arts in Cincinnati. The Corbetts built the home in 1959 and lived in the home for the remainder of their lives. After selling Nutone in 1967, they devoted their lives to the Corbett Foundation and supporting the arts with a focus on the musical arts. Their support for the Cincinnati Symphony Orchestra was unwavering, and they also provided significant financial support to CCM. Corbett Auditorium and Corbett Theatre are important venues at CCM and provide some of the most innovative productions in the area. When they decided to build a new home, they turned to John deKoven Hill to design their residence, an architect who previously worked in Frank Lloyd Wright’s office and started his own firm. deKoven Hill’s approach to architecture was based on Frank Lloyd Wright’s theories with his own personal interpretation. The home’s design is an excellent example of Frank Lloyd Wright’s prairie style of architecture. The home includes features such as a performance space for private concerts, an indoor pool, a state-of-the-art kitchen, and terraces that link the interior spaces to the landscape around them. Nutone technology was showcased throughout the house, and the home’s technology was years ahead of its time. The residence was considered so notable that House Beautiful magazine did a feature article on the home after it was built and included more than 100 pages of information on the amazing house. The home’s current owner purchased the house from an interim owner who purchased it from the Corbett estate. The interim owner made changes to the home by upgrading the kitchens and bathrooms, and one of the terraces has also been enclosed to provide additional space in the home sensitively blending with the original design. Furniture has been removed from the home, but the residence’s character remains. Tickets to this event are no longer available. The AFC Gallery will present an exhibit of the House Beautiful article to the public. Reproductions from the magazine will be enlarged and displayed to allow interested individuals to learn more about the original design of the house. The exhibit will be on display Tuesday thru Friday from September 27 to October 7. Gallery hours will be 11 am to 4 pm. The exhibit may also be viewed after this period by appointment only thru the end of October. Please contact the AFC offices directly to schedule an appointment. We hope you can join us for a tour of this significant residence. It clearly exemplifies how design can be transformative to the residents of a great house! Check out the event brochure, this article from WCPO, or this one from Cincinnati.com to get additional information about the residence.